A new season of Stranger Things isn’t the only thing the 80s nostalgia-inducing franchise has coming soon. Some new products are coming that will either help you relive your youth, or finally give you a chance to have fun like people (nerds) (guilty) did in the 80s, though now with an added touch from your favorite TV show (that is, if you take them out of the box). The Stranger Things Dungeons & Dragons Starter Set contains everything players need to embark on a Stranger Things adventure including the essential rules of the roleplaying game. 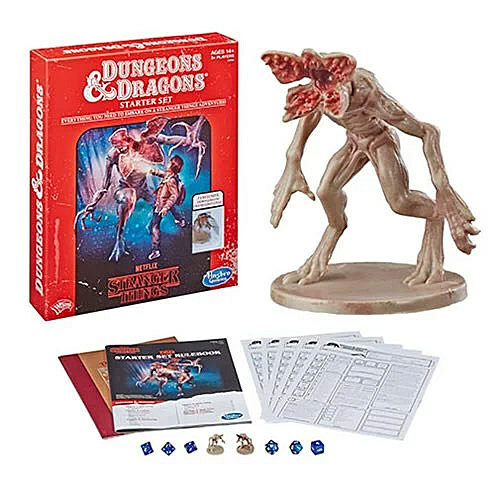 It’s a great way for new as well as seasoned Dungeon & Dragons players to experience the D&D adventure Stranger Things character Mike Wheeler has created for his friends. Pick your character — will you be Will the Wise or Dustin the Dwarf? Get your fireballs ready as you investigate the mysterious castle and battle the ferocious Demogorgon. Prepare for just about anything, because the game just got stranger. Includes Stranger Things Adventure book, Rulebook, 5 Stranger Things character sheets, 6 dice, Demogorgon figure, and Paintable Demogorgon figure. How well do you know the 80s? Head back to a great decade in history and challenge friends with questions about the wild, wacky, totally tubular 1980s and all things Stranger Things! This edition of the Trivial Pursuit game features 1500 trivia questions from 6 categories: Movies; TV; Music; Famous People and Events; Trends, Tech and Fun; and Stranger Things. The party game also includes Portal Spaces; land on one and you have to flip a section of the board over and send all players to the Upside Down where you can lose wedges. The first player to collect 6 wedges wins. 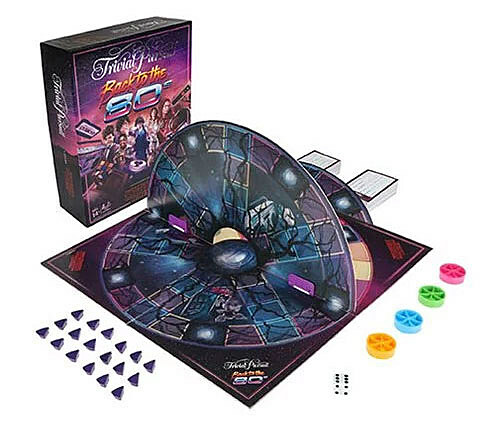 For fans of the Netflix original series, and those looking for a lighthearted and entertaining board game for game nights, get-togethers, and parties, The Back to the 80s edition of the Trivial Pursuit game makes a great choice. Includes gameboard, 250 trivia cards (1500 questions), 1 die, 4 wedge holders, 24 wedges, middle board piece, 2 hinges, cardholder, and instructions. Both of the above items are now available for pre-order along with new Series 4 action figures that are also on the way. Those and many more Stranger Things items (like a Smoke Monster plush) are available for sale at Entertainment Earth. P.S. music and toy fans, we are also currently giving away a Biggie Smalls Funko Pop. More details HERE. And check out that Stranger Things Season 3 trailer.